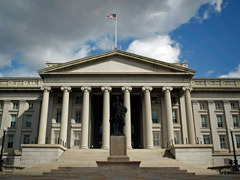 Short US Treasury no load funds can be a very attractive investment option right now, with the economy faltering and many markets experiencing very volatile price swings. Like the name implies, short term treasury fund investments are done using short term United States Treasury backed securities. These securities have a short term maturity time, so they do not need to be held by investors for years. When you use treasury money funds, you have the benefits of greater flexibility and liquidity as well. Unlike purchasing these securities directly, investing in mutual funds which purchase these securities means owning shares which are actively traded every day. These shares can be liquidated when necessary, without long waiting times or low trading numbers. Buying no load funds means saving load fees, and this is money which can be invested instead to earn a return for you. Treasury money funds have very low risks associated with them in exchange for smaller returns. Because these mutual funds invest in treasury securities which are backed by the United States Government, there is very little risk that a default will occur which could cause you to lose your investment capital. This does not mean that all short US Treasury mutual funds are the same, because they are not. Even the same types of mutual funds will have different fund expenses and fees charged. Make sure that you do all of the necessary research before choosing the short term treasury fund which is right for you and your investing needs. Compare the fund expense ratio, and 12b-1 marketing fees, and any other fees or charges associated with a fund. Some funds may appear to be no load funds but may actually have load fees hidden in the 12b-1 marketing fees or the fund expenses instead of calling them load fees. One way to determine a true no load short US Treasury mutual fund is to look at both the 12b-1 marketing fee and the fund expense ratio. If the 12b-1 marketing fee is more than one fourth of one percent of the total net assets of the fund, it is not a true no load fund. Another clue can be a fund operating expense ratio which is significantly higher than the amounts charged by most no load funds. One no load short term treasury fund is the Vanguard Short Term Treasury mutual fund, investors class. This fund was started in 1991, has no load fees, and only invests in treasury money funds with short term maturity dates. This is just one of the many true short US Treasury no load funds which can help you protect your investment capital and minimize your investment risks. Mutual funds have the advantage of pooling together funds from many single investors. This allows for more flexibility and can result in better performance when compared to returns for individual investors. With the economy faltering and the markets all around the world in a state of flux and high volatility, short US Treasury mutual fund investments makes perfect financial sense. Instead of your money laying around, it can be earning a return for you. It may be somewhat small compared to the stock market or other investment options, but this is because there is almost no risk involved at all. The chances of the US government defaulting on debt is not very likely at all. Treasury money funds can help you earn small but consistent returns on your investment with little risk that you will face devastating losses because of a large market drop or high volatility. A short term treasury fund investment can be the safest option right now for your investment capital.